VERMONT MADE, ORGANIC, GLUTEN-FREE, VEGAN & DELICIOUS! Holiday Party Bag - Gourmet Popcorn - Vermont Made - Serves 7-60 - Maple, Herb, Chipotle, Salt, Chocolate, Vanilla, Pumpkin, Berry & more! 4 Large Popcorn Bag SALE - DISCOUNT - Gourmet Popcorn - Made in Vermont - Buttery, Crunchy and SO Delicious! Announcement HAPPY HOLIDAYS!! GIFT the GOURMET POPCORN OF THE MONTH CLUB! Order up until 12/24 and you'll be emailed a certificate you can print out to wrap up! Then the first yummy popcorn order will arrive in January! All other orders placed by 12/17 will go out by the USPS deadline of 12/20 for Christmas. Contact me at KarensArtisanPopcorn [!at] gmail.com or 802-310-8963 if you need assistance. WELCOME TO KAREN'S ARTISAN POPCORN!! Can you smell the freshly popped popcorn? Here in my Vermont kitchen I'm busy kettle-cooking yummy, Vermont grown, gourmet popcorn, hot off the stove just for you! I delight in crafting unique flavors that are truly indulgent, and full of Vermont farm tastes. Every product is whole-grain, vegan, gluten-free, non-GMO, and all organic, not to mention unbelievably DELICIOUS! Check out the wonderful five star reviews from my very happy popcorn customers down below! 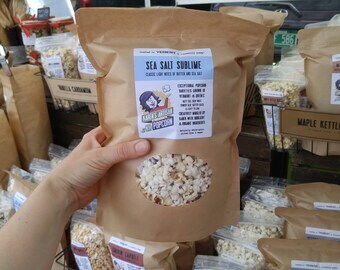 My passion for fun in life, and creating popcorn that brings people joy, is what Karen's Artisan Popcorn is all about! Let me know how I can bring popcorn happiness to you! Life, Laugh, Love, Local Vermont Popcorn! HAPPY HOLIDAYS!! GIFT the GOURMET POPCORN OF THE MONTH CLUB! 2 Large Popcorn Bag SALE! - DISCOUNT - Gourmet Popcorn - Made in Vermont - Buttery, Crunchy and SO Delicious! 3 Large Popcorn Bag SALE - DISCOUNT - Gourmet Popcorn - Made in Vermont - Karen's Recipe is Buttery, Crunchy and SO Delicious! 1/2 lb Gourmet Popcorn Kernel Mix - Made in Vermont - From organic Vermont and Canadian farms! 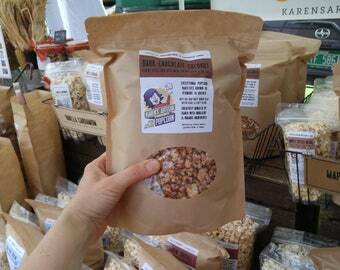 1 lb Gourmet Popcorn Kernel Mix - Made in Vermont - From organic Vermont and Canadian farms! 1 1/2 lb Gourmet Popcorn Kernel Mix - Made in Vermont - From organic Vermont and Canadian farms! 2 lb Gourmet Popcorn Kernel Mix - Made in Vermont - From organic Vermont and Canadian farms! 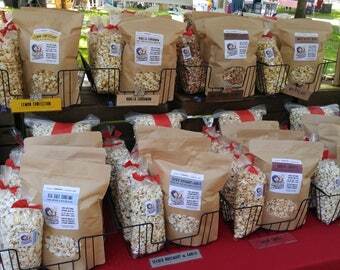 VARIETY 4 PACK - Gourmet Popcorn - Made in Vermont Choose any four of Karen's delicious flavors! VARIETY 5 PACK - Gourmet Popcorn- Made in Vermont - Choose any five of Karen's delicious flavors! Sea Salt Sublime Popcorn - Gourmet Popcorn - Made in Vermont - Light notes of butter and sea salt on artisan, kettle-cooked VT popcorn! Great Product. The popcorn arrived before Christmas. Excellent Seller. Our popcorn will be the talk of your party, like here at Hotel VT's Ice Bar. Place an order today for your party! 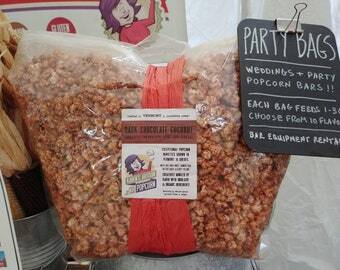 Ask about my bulk bags for a GOURMET POPCORN BAR at your special event. Choose from any of my 10 flavors! 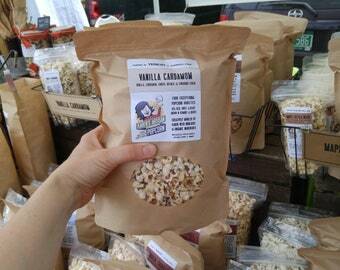 Find me and my popcorn in Vermont stores and at the Burlington (Sat) and Stowe Farmers Markets (Sun)! I use FIVE exceptional varieties of organic, non-GMO popcorn from VT & Quebec farms near me. Yum! I make delicious popcorn every week, so your order is freshly popped just for you! Each bag stay yummy for over 40 days! INDULGE IN THE DELICIOUSNESS OF LIFE!! Growing up, I learned my love of baking from my mom, and the exciting chemistry behind cooking, from my dad, a food scientist. So, I've always had fun creating in the kitchen. It only seems natural then, that my enchantment with the movies would inspire me to want to perfect my own popcorn recipe, right? Yes! After years of yummy research, my flagship flavor, Herbaceous Blend was born! A perfect balance of herbs, spices, and sea salt. I'd discovered that my favorite way to make my popcorn is kettle-cooking. A technique that's not only fun, but delicious! I cook my popcorn in organic canola and olive oil, which infuses a subtle buttery flavor into the popcorn, then just add toppings! On my popcorn journey, I'd also discovered my love for organic and local food, leading me to find local VT farmers growing organic popcorn, and any other organic ingredients I could get me hands on. Vermont's mountains, surroundings and people inspire me every day. Whether my marvelous husband and I are out hiking, snowshoeing, meeting new people, cooking up local farm foods, spending time with family and friends, or just enjoying the day together. That's what makes me passionate about sharing my popcorn with others. That and the fact that all our family and friends said, "You must sell this, Karen!" I can take a hint! I believe in finding the best organic ingredients, taking special care in preparing each batch, and sustainably packaging it. I have so much fun creating my popcorn flavors and experimenting with new flavors. Meeting so many wonderful popcorn fanatics, like myself, through farmers markets, events, stores, as well as here on ETSY, makes it even better! I find true joy in enjoying what each day has to offer and making a hand-crafted, gourmet popcorn that makes people so happy! To learn more about what's happening with Karen's Artisan Popcorn right now, go to Facebook.com/KarensArtisanPopcorn! Hi, I'm Karen, owner, president, & popcorn chef at Karen's Artisan's Popcorn. I grew up in RI, went to college in Boston, & now live with my husband and two cats in VT. I love family time, the outdoors, laughing, watching movies, & of course cooking! Welcome to Karen's Artisan Popcorn! 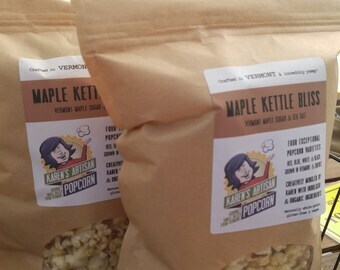 I am so excited to be bringing you my Vermont-made, gourmet, organic popcorn creations and popcorn products! I create 11 flavors with my signature buttery and crunchy recipe, mingled with select organic toppings which delivers a truly exceptional popcorn experience. I gather FOUR flavorful kernel varieties from local Vermont and Quebec farmers: nutty red, crunchy blue, buttery black and crisp white. 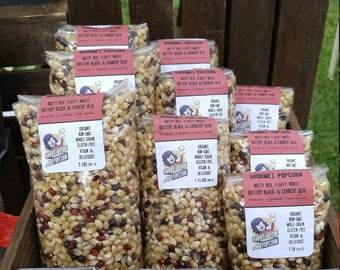 My popcorn is a truly indulgent treat that you won't be able to get enough of, so make sure you order enough ;)! Thoughtfully and joyfully made with only USDA organic ingredients. Naturally whole-grain, non-GMO, gluten free and vegan. I make fresh popcorn each week in small batches for the best quality, but my popcorn actually lasts for over 30 days! I use FDA-approved bags and heat seal in the freshness. I personally taste-test each batch for the indulgent standard our customers have come to love. 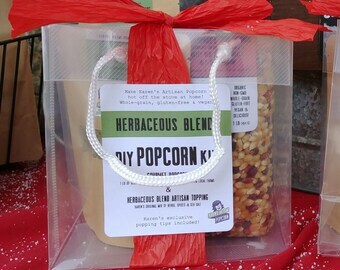 Give the gift of Vermont-made, gourmet, organic popcorn to yourself or someone else today! It's a truly delicious and unique gift that will be remembered. Gift wrapping, personalized note cards and more available! Are you near the Burlington, VT area? I'm available to cater local events, parties, OR movie nights at your house! Contact me with your theme, date, and size of order. 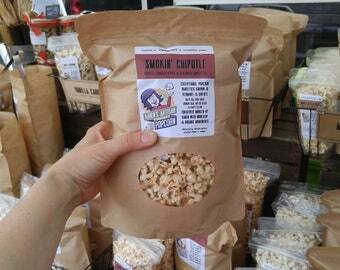 Interested in carrying my gourmet popcorn in your store or business? Ask me about our wholesale pricing. Why not indulge for yourself or someone else today! Thanks so much for visiting my popcorn shop! I strive to make the best gourmet popcorn for you, and get it to you when you need it. If for any reason you are not satisfied with your order please contact me within 24 hours of receipt of you order. I'll do everything I can to see that you are happy with your order. Order cancellations will need to be made before shipment is sent for a full refund. Please give yourself time to place your order (3-7 business days ahead of time, for me to joyfully cook up a batch for you!) and to assure that you get your order filled in the time frame you need. Very large orders may take longer, so please place as far in advance as you can. I of course will do everything in my power to make your gourmet popcorn dreams come true! Don't hesitate to contact me so I can give you personal service when you need it. I accept Paypal, debit/credit cards, check and cash (local deliveries only for cash payments). Your order will be shipped/delivered as soon as your full payment has cleared. All yummy Karen's Artisan Popcorn products are shipped via USPS, unless otherwise requested (additional charges may apply). After full payment is made I will ship your order and Etsy-message you a shipping notification with tracking number. Priority Mail/Priority Mail Flat Rate is the most economical/speedy option for your popcorn order to get to you. Priority Mail takes 1-3 days to ship from me to you, and in most cases it usually ends up being 2 days. It includes $50 of insurance. If you need Express shipping (additional charges will apply), please make sure to select that option before checkout. I want you to get your gourmet popcorn when you need it! If you are in VERMONT, within a 30 mile radius of the Burlington area, I am happy to personally deliver your order! If you already paid for shipping your shipping costs can go towards additional yummy popcorn products. Message me and we can arranging a mutually agreed upon delivery location. If ordering more than 9 bags of popcorn, please know that I will need to ship in additional boxes, with corresponding shipping charges. Buy, hey, who doesn't like more popcorn?! I'll share your options with you when you place your order, or if you inquire before hand. Please be aware that processing and shipping can take longer around holiday seasons, but I'll do everything I can to get your popcorn to you on time! 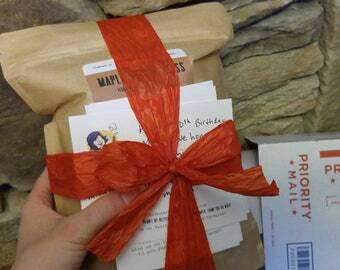 Karen's Artisan Popcorn makes a superb gift, so I'm more than happy to gift wrap your order and ship to another address. Just include that option in your shopping card and add a message to your order with your personal sentiments that I'll hand-write onto a note card. If you'd like further personalization please let me know so I can help make your popcorn gift vision come to life! Karen's Artisan Popcorn is not responsible for damage during shipment, but I'll do all I can to help you resolve any issue that arises, and make sure that you get your popcorn order. If damage does occur, make sure to take photo evidence. 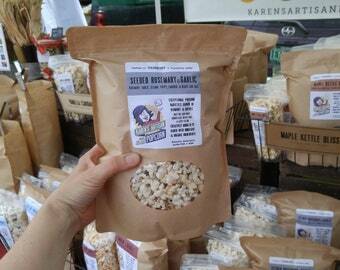 Karen's Artisan Popcorn is made thoughtfully, in a clean and modern home kitchen. I use sustainable cleaning supplies, and pay attention to allergens and hygienic cleaning methods. However, tree nuts, peanuts, dairy, seafood, wheat and eggs are also used in my kitchen. Every product has ingredient information on the back tag. I do my best not to let any un-popped kernels sneak into my bagged popcorn, but occasionally they do. If you have any questions please don't hesitate to ask me! It is important to me to make sure all of my customers are thoroughly happy!